Having been to the wilds of England. 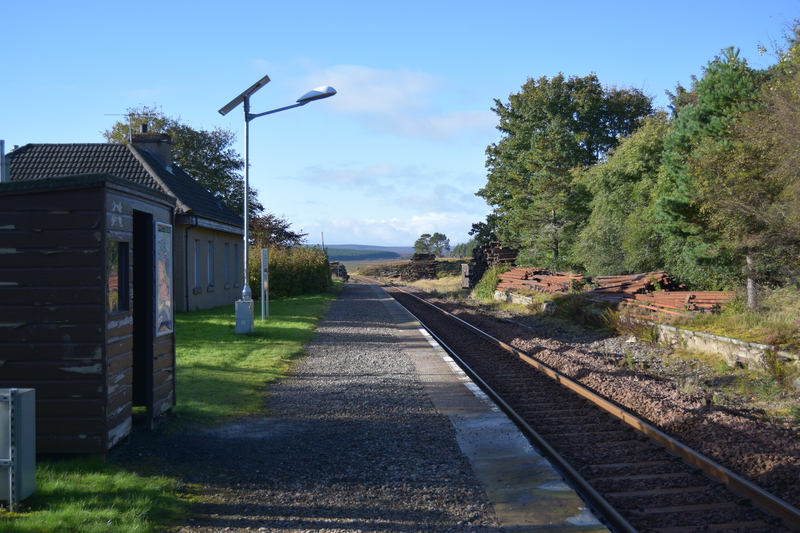 Scotland and Wales, a trip to Altnabreac on the Far North Line has completed my travels for Remote Stations. In all I’ve visited 40 stations, most still with a train service, if not always very regular, and a few long closed. I’ve walked across moors, marshes, fens and enjoyed some of the most remote and wonderful scenery in Britain, sometimes on foot and often through the train window. Both stations and trains have been of varied types and size and as I’ve researched each station many interesting tales have been unearthed. Remote Stations will be published by Matador in summer 2018. As the station is 12 miles+ from the nearest road and technically belongs to the Estate and not Network Rail ( transfer of ownership was never agreed by the estate) it remains the most remote station on the national rail network followed by Berney Arms in Norfolk, which is a mere 3 miles from the nearest road but has a poorer train service than Altnabreac. Corrour is another contender – and the first station in the book. Does your book include a photo of Berney Arms station? Yes, there are actually five photos of Berney Arms station in the book (2 colour, 3 black & white) plus one of the mill. Four of the station photos are recent and one is from 1947.